Molecular modeling methods are being used routinely for the prediction and analysis of three-dimensional structures of biological macromolecules. Generally, prediction of three-dimensional structures of macromolecules is done by X-ray crystallography or NMR spectroscopy. But these methods are time-consuming and not always suitable for all types of proteins, especially for larger proteins. For some proteins, it is difficult to obtain the crystals; therefore, 3D structure determination of those proteins by X-ray crystallography is not possible. Limitations for NMR spectroscopy are the size of the systems, as NMR spectroscopy can be applied only to smaller protein systems. Therefore, prediction of three-dimensional structures of proteins/enzymes from their amino acid sequence can be achieved by using different types of approaches such as “comparative” or “homology” modeling. Thus, computational methods have been used to investigate the three-dimensional structures of amyloid beta peptide-degrading enzymes. Molecular modeling methods like energy minimization, molecular docking, molecular dynamics simulation, virtual screening, binding free energy, and solvent-accessible surface calculations are widely used to understand molecular interactions between Aβ-degrading enzymes and amyloid beta peptides. 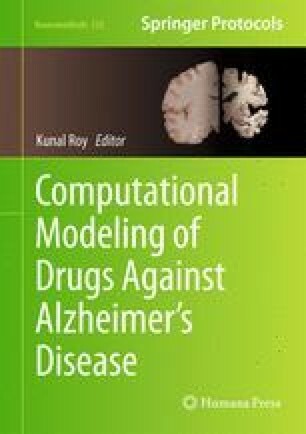 Thus, the present chapter deals with the applications of computational methods to investigate structure-function relationship of enzyme Aβ complex and to design new lead molecules to control amyloid beta peptide levels in Alzheimer’s disease. KDS is thankful to the University Grants Commission, New Delhi, for providing financial support. KDS gratefully acknowledges the Department of Science and Technology, New Delhi, for providing financial grants. MJD is thankful to DST for providing fellowship as a research assistance under the scheme DST-PURSE. The authors are thankful to Computer Centre, Shivaji University, Kolhapur, for providing the computational facilities .